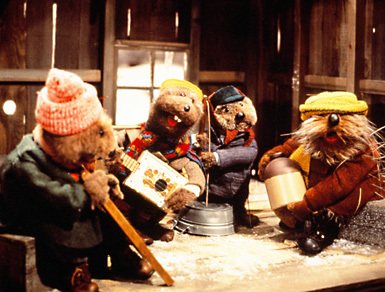 There are many many things I LOVE about Jim Henson’s Emmet Otter’s Jugband Christmas including, Emmet, his mom, the jugband, his friends, the sets and the music. BUT, when I’m really honest. I mean REALLY honest, I have to admit that my truly favorite part is The River Bottom Nightmare Band. I know they’re jerks, especially Chuck, the surprisingly cuddly-looking yet mean bear leader. But I LOVE them. I saw this film once on HBO back in 1978 (I’m guessing) and never saw it again, but the River Bottom Nightmare Band’s song stuck with me through the ages in all its angry menace. Back in the days before Youtube, we couldn’t find clips of stuff so we had to make due with memory or fill the void with replicas. And this is why I am straight up certain that Emmet Otter’s Jugband Christmas led me to love Alice Cooper, Iron Maiden, Megadeath, Manowar and King Diamond in my teen years. So thank you, Jim Henson and friends. I’m so pleased to be able to bask in my love of the metallic mastery of The Riverbottom Nightmare Band on DVD now and it’s currently streaming on Netflix. I love this movie! One of my favorites. It did not serve as a gateway to heavy metal. But I’m glad it did with you and that this movie is being talked about. Yep, it really is a treasure. Perhaps it can be your gateway to metal now? It’s never too late to love King Diamond, or at least be terrified by him.